By Lib Ruytenberg in answer to a question re swallows nesting. When I moved to my house 8 years ago there were no swallows then I had one pair nesting in the carport. Numbers have progressively grown so that this season there were 6 nests, all of which had at least 2 and mostly 3 clutches. 2-4 chicks per clutch. Last few years they had 3 rounds as well. The resident Willy Wagtails also had 3 clutches this year. I think there are various possible predators of nestlings; pythons, monitors, rats, and other birds. I often hear alarm cries when blue-faced honey-eaters go to the wagtail nest--though the honey eaters are more likely to be trying to steal nesting material, I suspect. I cannot guess what was the problem with your second clutch, apart from suspecting it was a predator. We have had some success in smuggling the odd swallow chick or two from elsewhere into nests of same age chicks; the parenAugust 3, 2015a bit frazzled. Swallows develop so quickly that quite soon after fledging it's difficult to tell the adults from the juveniles. I suspect they will have 3 clutches if the conditions are right. Lights from your house which attract insects are helpful for them. I think they like my place because there is insect attracting cow poo close by as well. At the beginning of Spring I would have had up to 30 swallows around the house, now there are maybe only 15. The others appear to have dispersed. 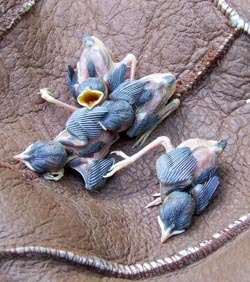 Swallow chicks are quiet compared to other nestlings. They tend to get a bit noisy when they are closer to fledging. Denise and Mike from Teven did all the right things when they found a dead wallaby just outside their driveway early in the morning, they checked the pouch and discovered a small joey. They gently removed it from the pouch, wrapped it snugly and called WIRES. The little joey is a male Swamp wallaby , he is approximately 6 months old and lightly furred, still very much dependant on his mum. He will be in care for about 7-8 months before he will be ready to venture back to the wild. In the mean time he will spend time (after settling in) with other joey's already in care. Unfortunately the little joey died of internal injuries 9 days after the car accident. WIRES member Allira was called to rescue a Kookaburra fledgling sitting in a small tree looking quite bedraggled and wet from the rain. Allira managed to catch it & it called out to the 6-7 adults in a big tree near by, who became agitated. Conrad who had called WIRES said his Mum knew exactly where the nest was, but it was very high up in a big tree. 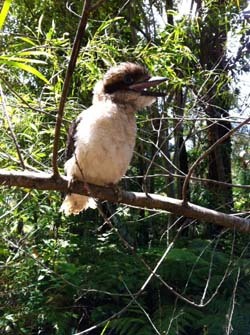 The little Kookaburra was dried of and kept in care overnight as the weather was predicted to be rather bad that night. 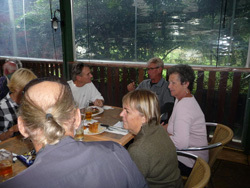 The next morning looked a lot better and the Kookaburra was reunited with his family. 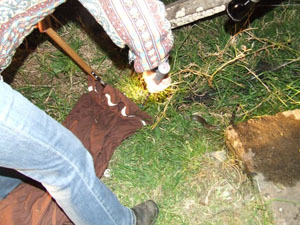 Images taken by Allira after releasing the little fellow. When WIRES carer Leoni was called to rescue "some kind of possum " she was intrigued not knowing what to expect. The member of the public had been alerted to the glider by his dog, most fortunate as you would not have been aware that it was a live animal by looking at it, more likely a small bunch of leaf litter on the ground. It turned out to be a little juvenile Sugar Glider in a very sad state. It was covered in leaf matter, sticks and very sticky pine sap all glued together the little glider was almost unrecognizable. He was dehydrated and undernourished so he may have been in this state for a while. Leoni gave him a gentle bath and cleaned of as much as she was able without causing further stress to the little fellow, gave him rehydration fluid and something to eat, before settling him down for a sleep. He is seen here after his bath and a bit of a rest. There is still lots more sap to clean of, this will be done slowly as he gains strength. He is not entirely out of danger yet, but we hope he can recover from his ordeal in time. 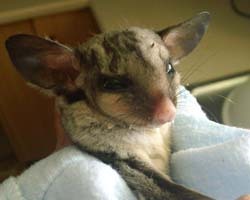 The glider had a full recovery and was released back to his home territory 2 weeks after his ordeal. 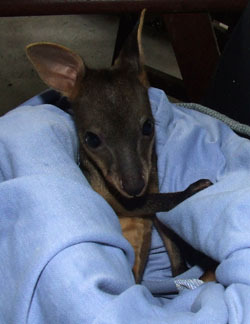 Casino vet clinic called WIRES when they received a little wallaby joey from a member of the public at Tabulam. The little fellow is a Whiptail wallaby also known as Pretty faced wallaby, he is about 6 1/2 months old so will spend many months in care before being released back to the wild.. Yet another little little Whiptail wallaby this time a female came in to care from the same area. They will be raised together and released back where they came from when ready to fend for themselves. 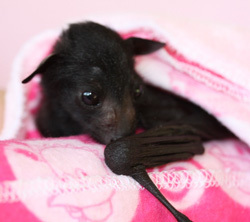 The WIRES hotline recently received a call from Katherine and David in McKenzie St., Lismore about a small bat which had appeared on a screen door. 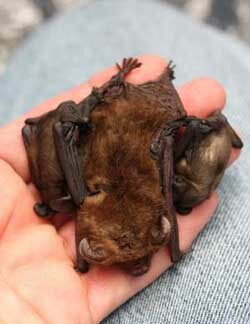 Bat carer Lib Ruytenberg went to investigate and found a Gould’s long eared microbat. Upon closer inspection, the adult female had a bulge under each wing. She had 2 velvet pups; one male one female.The pups (named Katherine and David) were very firmly latched onto a teat in each wing pit. All were apparently healthy. Mamma (named McKenzie) had so much ballast she was unable to take off. Total mass on intake was 19 gr; assuming McKenzie is 13 gr so the pups would have been about 3 gr each, close to half her weight. After 3 days in care, their total mass is 26 grams. To maximise the chances of their survival, they will be kept in care until the pups are independent…which will only be a few weeks. It was early April when I picked up a young Pheasant Coucal chick to take into care. He couldn't’t have been more than a couple of weeks old and so must have come from a second and late clutch of the season. I called him Scooter for the way he ran from side to side of the aviary whenever he saw me coming with the food. Two weeks later I picked up another Pheasant Coucal chick. This one was a bit younger than Scooter. I christened him Took and he joined Scooter in the aviary in the orchard. Right from the start it struck me how different they were in temperament. Scooter was the dominant one. He was an extravert. He made the most noise and bit my toes if I was slow in feeding him. Took was quiet and gentle. He would hang his head like a shy child when he’d had enough to eat. He never bit toes. When they were old enough I released them both in the orchard. After a couple of weeks they moved from the orchard into the hedge at the back of the house. The hedge is close to the back verandah where they would then come for their morning and afternoon feeds. catching enough insects for themselves at that time of year. Occasionally they would go away for a day or two but would always come back hungry. So I continued to support feed them throughout the winter. In mid August I noticed a change in Scooter’s appearance. A few black feathers had appeared among the pale russet ones on his breast. Within a few weeks all the feathers on his head and under parts had turned black, the glossy feather shafts prominent against the sooty black of the feathers. Along with the adult breeding plumage came the adult calls. The more common one comprised a dozen or more loud hollow booming notes delivered in rapid succession. When making this call Scooter would lower his head and arch his back. Amazingly his mouth would remain closed, the sound seeming to emanate from deep within his body. Another call made less frequently consisted of a series of short rasping notes also delivered in quick succession. For this call his mouth would be open and the sound seemed to come from his throat. A few weeks later I noticed the first black feathers emerging on Took’s breast. 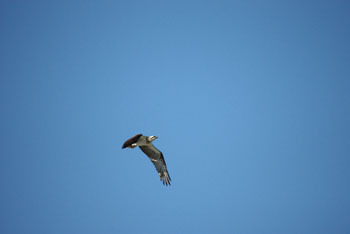 His transition to full breeding plumage had started and within a short time he was also making the territorial calls. In late September they were both still living in the hedge at the back of the house. One evening, just before dusk, Scooter came up to the verandah and hopped on the table in front of me. He seemed to be in an agitated state, flapping his wings in quick short beats and making a loud chattering call. He did this for several minutes before taking off into the night. I was perplexed at first as I hadn't’t seen him behave in such a way before. Then it occurred to me that he had been trying to tell me something. And I felt sure that I knew what it was. 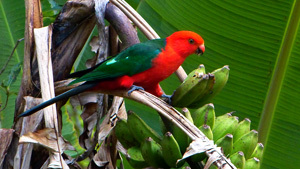 For what ever reason – to look for a mate perhaps – I was almost certain that he’d come to let me know he was leaving. It had been at least three weeks since Scooter had left when unexpectedly both he and Took showed up in the garden within a few minutes of each other. One was chasing the other. At first I thought they were playing a game as I had seen them do in the past. But it was no game. The games of the past had merely been preparation for this. Surprisingly it was Took who was the aggressor and Scooter the one being pursued. It was a ritual that was to be repeated every day from morning to night over the next week. 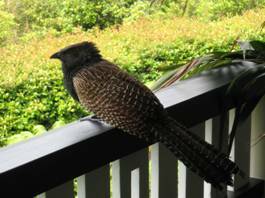 I was also surprised to see that there was now a third Pheasant Coucal in the garden. It was similar in size to the other two but still speckled black and tan on its breast. Was the newcomer a young female? Over the next week I saw the younger one several times, always at the edge of the fray between the other two. Took was relentless in his pursuit of Scooter. He was calling constantly. Scooter was silent and seemed to have no defense against Took. At various times I found him hiding under the house, in the garage and even inside the house. It seemed inevitable that Scooter would eventually have to concede the territory - and the female? - to Took. But it wasn't’t the way things turned out. After a week of tirelessly pursing Scooter it was Took who eventually gave up the chase and left. In Took’s absence Scooter soon regained his old composure and was in the hedge calling again. Then three days after he had left, Took returned. But inexplicably, in that short time something had changed in the relationship between them. As soon as Scooter saw Took he was after him. He chased Took with the single-minded determination that Took had chased him only days before. By the end of the day Took had had enough. He came into the house in a desperate attempt to escape from Scooter. But Scooter knew that trick. Within minutes Scooter was in the house looking for him. He started chasing Took round and round the lounge room. I shooed them out of the lounge and they went in to the kitchen where an all out fight broke out. I managed to get Scooter out of the house leaving Took crouching in the corner. He stayed there until the cover of darkness gave him the chance of escape. The next day there was no sign of Took. Scooter was in the garden calling. His calls seemed more exuberant than ever. It appeared that he had won the battle for the territory at least. All through spring the days were punctuated with Scooter’s resonating calls. One day in mid November I noticed his calls being answered by a similar but deeper call nearby. This was the responding call of a female. Scooter redoubled his efforts but by the next day she had gone. Perhaps Scooter’s choice of territory was too close to that of humans. 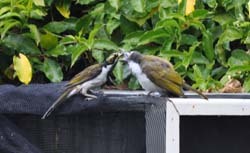 Perhaps it’s not unusual for young birds to fail to find a mate in their first year of sexual maturity. But perhaps it’s still not too late for Scooter to find a mate and have a late season brood like the one that he had come from. Some time after these events I was driving home when I saw a Pheasant Coucal take flight from the roadside about half a kilometer from the house. I stopped the car and followed him into the trees where I saw him sitting in the undergrowth. I approached cautiously until I was close enough to see that it was Took. I called to him and he came slowly towards me until he was only a couple of metes away. He was making a soft chattering sound, a sound I’d heard him make before when he was young. I stayed there with him for a few minutes before heading back to the car. 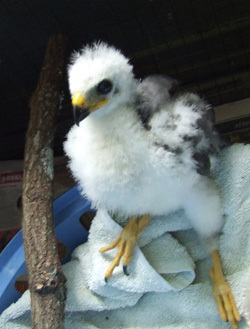 It had been more than six months since I had picked up Took as a little chick. It was gratifying to see that he had become the adult wild bird that had been his birthright. Raising two Pheasant Coucals turned out to be a somewhat bigger commitment than I had anticipated. But it had its rewards. I had seen at close hand some remarkable aspects of bird behavior. It was a window into the natural world, a brief intimacy with nature that most people never have the opportunity to experience. It’s something I wouldn't’t have missed. Now there is just one thing that is bothering me. 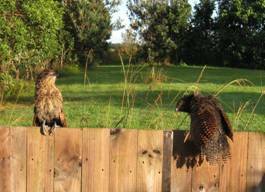 What will I say if I get a call from WIRES this summer asking me to look after a couple of Pheasant Coucal chicks. At times WIRES deal with extremely upsetting animal cruelty issues. This little Magpie fledgling is one such case. 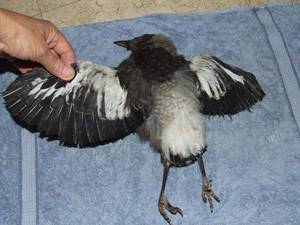 Our hotline was contacted on 3 November regarding a little Magpie fledgling being attacked by other birds on the corner of Eccles St and Bruxner Highway, Casino. When the carer collected the bird it became obvious that the little one had been subject to an act of cruelty. 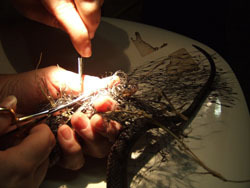 Closer inspection of the chick revealed every feather of both its wings and its tail had been cut short with scissors. 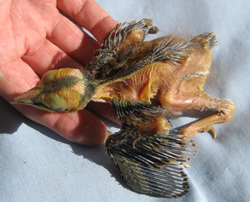 The chick was starving and despite intensive care it died on 5 November. 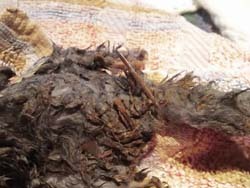 This cruel act caused much unnecessary suffering and ultimate death of a young bird. Deliberately injuring our native wildlife is punishable by large fines. 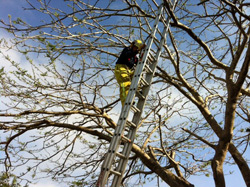 WIRES carer Leoni responded to the call, and after seeing the situation called Alstonville Fire brigade for assistance. 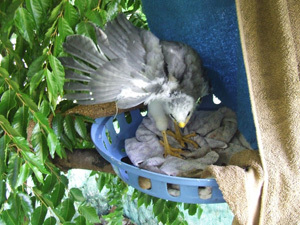 This beautiful Grey Goshawk chick was found under a large gum tree at The Channon by Ross. 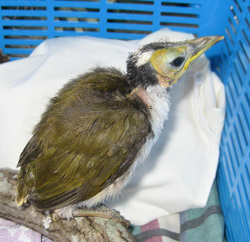 The chick had fallen from its nest and injured its wing. X-rays taken by Casino vet clinic showed no breaks and hopefully with medication and rest it will heal. He is a very feisty little chick and lashes out with those big talons whenever he gets the chance. 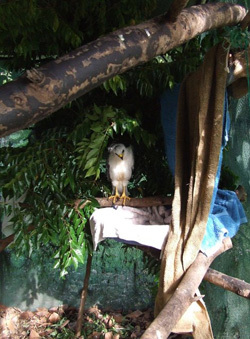 I set the goshawk up in the aviary today, she sits up on the perch or hunkers down in the 'nest' when she needs a sleep. She has put on lots of weight and is tearing up food herself now. Her wing is looking much better,so fingers crossed. 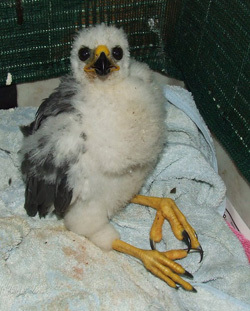 The little Goshawk chick has fledged and is not a little chick any more. Hopefully she will be reunited with her family next week. 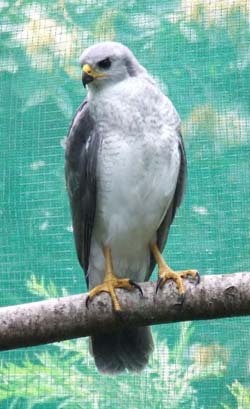 After four weeks in care the Grey Goshawk was ready to be released. 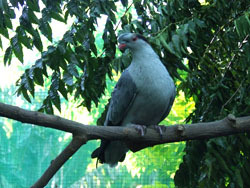 She had built up her strength in the large aviary and was quick and strong, able to carry her prey from the ground to a high perch. 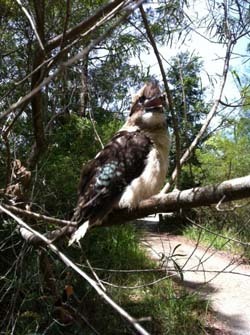 She was was released where she was found, near the huge gum tree that held her nest. Although her parents and sibling were not seen, they would have still been in their territory. 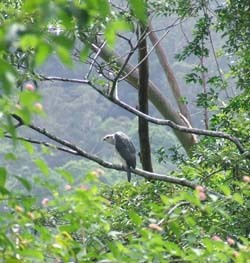 She flew to a sheltered position, preened and closely watched some small birds. She was obviously happy to be home. 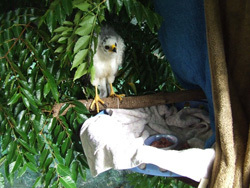 After four weeks in care the Grey Goshawk was ready to be released. able to carry her prey from the ground to a high perch. She was released where she was found, near the huge gum tree that held her nest. She flew to a sheltered position, preened and closely watched some small birds. She was obviously happy to be home. This magnificent Greater Glider is currently in care with WIRES carer Leoni, he was found by Sharon of Coraki on Sunday 30 October lying on the side of the road at Myall Creek. Sharon immediately called WIRES for assistance. 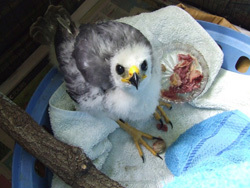 It was at first assumed that he had been hit by a car, but extensive wounds on the under side of the glider indicate that he may have been picked up by a Powerful owl some time ago and dropped. 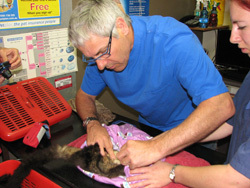 The glider was taken to Alstonville vet surgery where veterinarian Mike FitzGerald is seen here treating the wounds. The glider is undernourished, suffering infection from his wounds and is currently on antibiotics. Currently Leoni is working out which species of eucalypt this particular glider prefers, which means driving long distance to Coraki locating the different trees, picking branches from each tree, then back home in order for the glider to choose. He is a very sick animal right now, the road to recovery is long, but his bright eyes indicate he has the will to fight for his life and so does Alstonville vet Mike and WIRES carer Leoni. 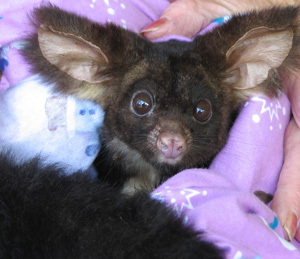 In 25 years of caring for native animals it is the second Greater Glider Leoni has seen come in to care in the Northern Rivers area. 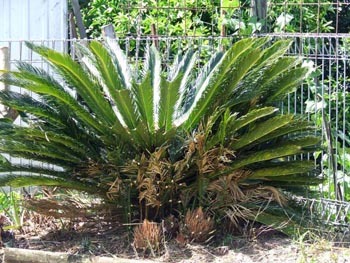 Although this species is not listed as threatened, it is extremely rare due to loss of habitat. 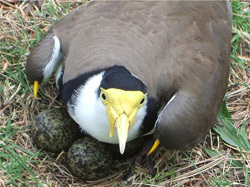 They require a large hollow in which to build their nest. Tree hollows normally take up to 200 years to form and longer for hollows large enough to accommodate this species. For them to survive, forest management, which retains buffer strips and protects old habitat trees, is essential. 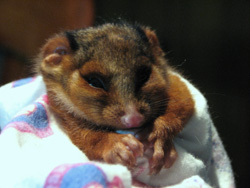 What happens on private property is equally important, gliders like these would certainly be living on many privately owned properties, and it is up to us to make sure we do not cut down old trees, as these gliders and many other species depend on them for their survival now and into the future. 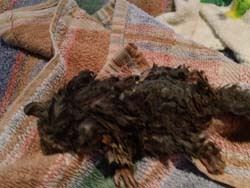 Peter from Alstonville intervened quickly when he saw this little Ringtail possum bailed up by a cat, he rescued the little juvenile wrapped her up snugly and called WIRES. The little possum is now in care with WIRES carer Annie in the company of another two juveniles and all will be released together when old enough to fend for themselves. 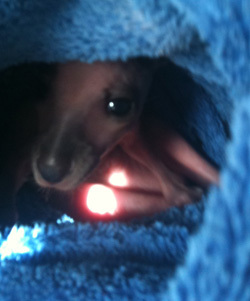 October is when flying-fox pups start coming into care. 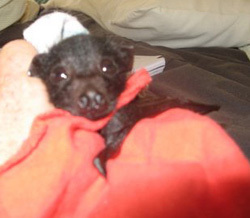 This little Flying fox pup is currently in care with WIRES carer Ros, Cullen is a Grey-headed flying fox and he is named after his rescuer in Nimbin. Cullen has gone from 85 grams to a little over 100 grams already. How gorgeous is he? 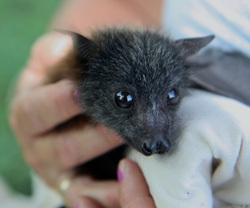 Recently three little flying-fox pups were fortunate to be found among the leaf litter in their back yards by members of the public who scooped them up and called WIRES. Hannah was found in Wilson’s Creek and is named after her rescuer. Riley was found at Riley’s Hill and was premature, weighing only 50 grams. After two weeks in care he now weighs 75 grams and is doing well. Hannah and Riley are black flying-foxes. Ruben was found by Ruby of Richmond River High School. 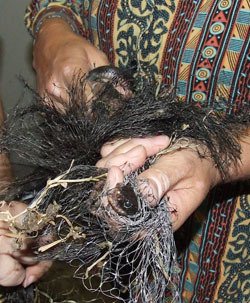 Ruben is the first grey-headed flying-fox pup of the season. This species is listed as vulnerable to extinction on the Endangered Species list, so we are particularly pleased that Ruben is doing well. 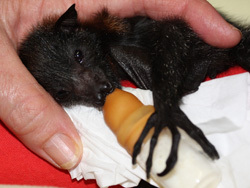 All 3 flying-fox pups Ruben, Hannah and Riley are now 6 weeks old and doing very well with their human carers. They drink regular cows’ milk four times a day and in two weeks will be introduced to blossom and fruit. They have already begun to stretch their wings and practice flapping. At about 10 weeks of age they will take their first flight. 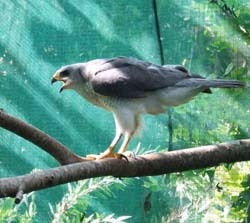 Then they will go into an aviary and will be soft released back into the wild with support feeding at about 14 weeks. Flying-foxes are nature’s gardeners because they are the only pollinators and means of seed dispersal for particular rainforest trees. No bats, no forests. It’s a simple environmental message. As wildlife carers, we enjoy raising orphaned flying-foxes not only for their crucial environmental role, but also because they are the only wildlife species which benefits from forming a bond with their human carer. We have to be careful not to humanise all other wildlife species. Flying-foxes, on the other hand, bond with their human carer for the first 10 weeks of life then just like human teenagers, only want to mix with their own kind and are not interested in their primary carers. At this point, we wildlife carers are happy knowing we have done our job and will soon see the young flying-foxes flying free. 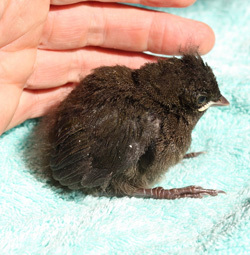 This little Butcher bird fledgling is currently in care with WIRES carer Elk at Byron Bay. 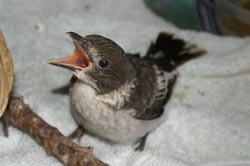 Many fledgling birds get in to trouble due to falling out of nests, this can happen during storms or simply due to the little bird being a bit too adventurous. In many cases the fledglings can be reunited with the family immediately, in other cases a few days later if the location of the nest is known. These four newly hatched fairy wren chicks were rescued by Jaidan after their nest was dislodged during some backyard clearing. Jaidan called WIRES and the chicks were brought into care, kept warm and fed (repeatedly!). The next afternoon, when the rainy weather cleared, a reuniting attempt was made. 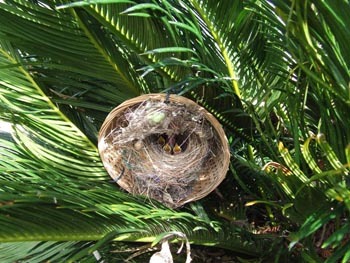 The dome shaped nest was tied to a small cane basket and then attached vertically in amongst the spiky fronds of a cycad palm, close to where it was originally located. Immediately, the parent birds arrived, checked out the nest position, and then started feeding their chicks. Thank you to Jaidan for rescuing these tiny chicks and helping to reunite the family. 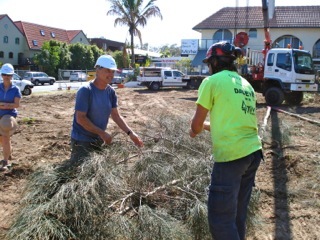 Work at the new Byron Bay library site came to temporary halt when construction workers discovered a bird nest high in one of the trees that had to be removed to make way for the development. Closer inspection of the nest revealed that it contained two baby magpies. The construction company contacted WIRES who suggested that the best option would be to attempt to relocate the nest and the two young magpies to another tree of similar type and height in an adjoining park. 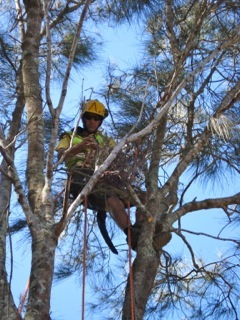 WIRES volunteers oversaw the operation which was carried out by Tallow Tree Services. 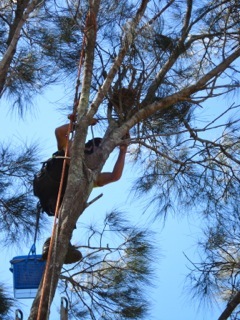 Using an extendable crane and specialized climbing gear TTS staff carefully retrieved the two chicks from the nest. 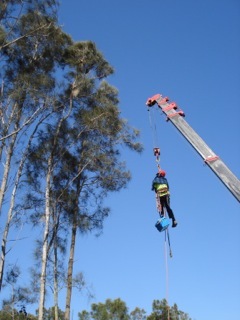 The tree was then cut and lowered slowly to the ground so that the nest could be recovered intact. 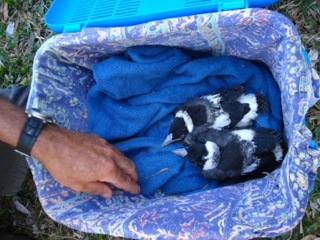 Once the nest was relocated in another tree about 20 metes from the original tree the baby magpies were reintroduced to their old home in its new location. The hope was that, despite the significant level of disturbance to the nest and the chicks, the parent magpies would accept the nest in its new location and would continue to feed and care for their two chicks. 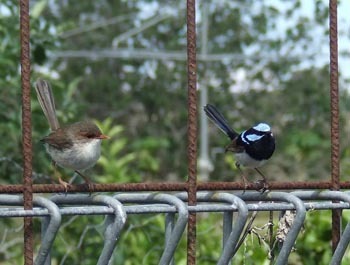 When WIRES volunteers returned to the site later that afternoon they were pleased to observe the parent birds at the new nest site feeding their chicks as if nothing had happened. WIRES is particularly appreciative of the effort by Tallow Tree Services who carried out the whole operation in a very professional manner. 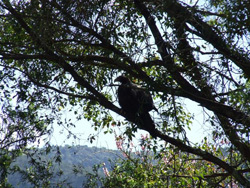 This female Wedge-tailed eagle was found injured on the road by Carl and Adam near Grevillia. Her mate was sitting nearby and it was a dangerous corner on the highway, so she is very lucky they were able to rescue her. They put her inside their twin cab ute and drove her back to Kyogle to Katherine, a WIRES carer. By this time the eagle had recovered somewhat, and she was not impressed to find herself trapped in a vehicle. It was a difficult job to get her out! 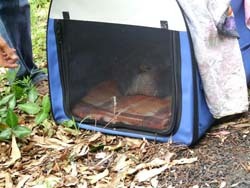 The eagle was picked up by Melanie who took her to the Casino Vet Clinic for assessment. Fortunately she did not have any fractures, but was concussed and sore. 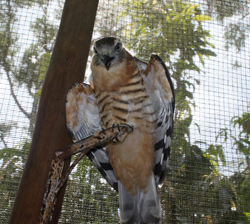 After some time in a smaller aviary she was transferred to Clarence Valley WIRES, to Maggie’s large flight aviary. After three weeks in care she was transported back to where she was rescued and released. After only 10 minutes her mate arrived and sat in the same tree. 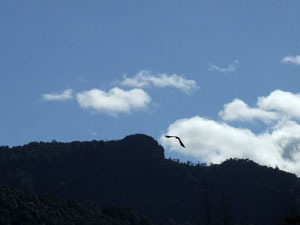 He then started soaring and she joined him, until they were both circling high above their mountain range home. Felling trees is some times a necessity but Victor from Alstonville did not expect a family of Sugar gliders had taken up residence in his garden. After felling a tree he found this tiny glider amongst the debris. 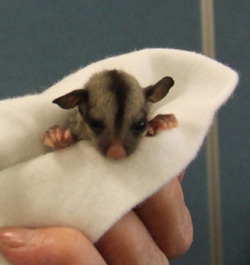 The little male Sugar glider will shortly be united with another two orphans already in care. Spring is in the air, chicks are coming in to care such as this little Eastern Whip bird brought in to Lismore Vet clinic from Coffee Camp near Nimbin. It will be returned to it's parents as soon as it recovers from minor injury to it's wing. 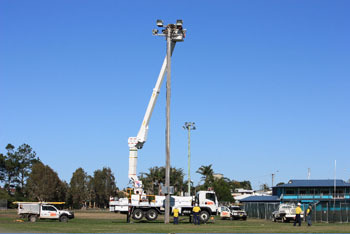 WIRES hotline received a call from Hunter Street Lismore where a de mountable was being removed. The problem was that plovers had nested on the roof of the de mountable and one chick had hatched the very day the de mountable was scheduled to be taken away! 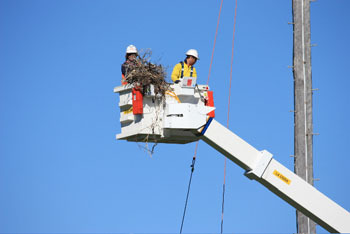 Workers from a nearby office who had been observing the nesting during the weeks beforehand were concerned. Christian of Woollam Constructions and Kerry & team from Lismore Fire Brigade co-ordinated with WIRES to attempt a rescue. 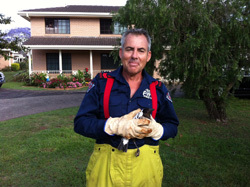 The Fire crew went up and delicately plucked one plover chick & 2 eggs from the gutter of the de mountable. The parent birds were very distressed, circling overhead and dive bombing the people. The de mountable was taken away. The nest with one tiny fluff ball chick & 2 eggs were placed in the clearing directly under where it would have been when the de mountable was there. The WIRES carer returned 20 mins later to see parent birds tending to their chick and relocated eggs. The workers in the nearby office continued to monitor the plover family. 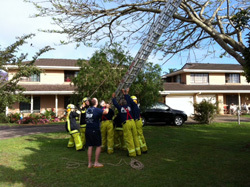 Thanks to the Lismore Fire Brigade for their assistance. The following day the hotline received a call from Julie in Ballina. Julie had seen a plover chick fall down a storm water drain on the busy Pacific Hwy and the parent plovers were circling in distress. The hotline called Ballina Council who sent Graeme Izzard to the scene to meet Christine, a WIRES volunteer, all within 20 minutes. Graeme retrieved two very small plover chicks from the storm water pit and carried the two little chicks across the highway to the park where the parent birds flew to their little ones. This was observed by Julie, who had contacted WIRES in the first instance. A great result. Thanks to all involved. This beautiful Emerald ground-Dove fledgling was rescued by WIRES carer Allira from Byron Bay, it has a neck injury which is being treated and we hope will heal fairly fast. Please be aware that birds are breeding now and some young ones may get in to trouble. Featherless birds will need heat. 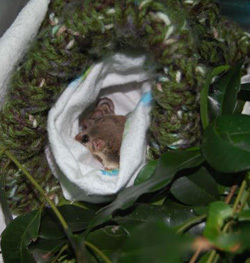 Place a WARM not hot water bottle in a box, cover the water bottle with towels, and place the young bird in something resembling a nest such as a small basket. Cover the box, keep in a quiet dark place and call Wires as soon as possible. 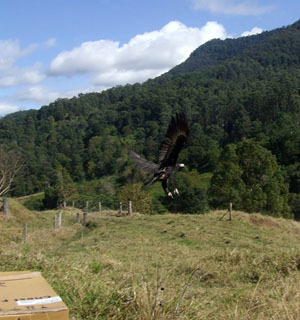 Late in June, in a forested Nimbin valley, a Wedge-tailed Eagle was found on the ground by Neil and Kerryn. After observing from a distance for some time, he investigated more closely. 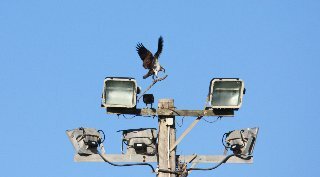 The eagle appeared to be injured so he managed to capture this huge bird and called WIRES Northern Rivers. 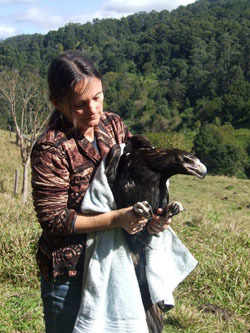 The eagle was placed in the care of Melanie, an Authorised Raptor carer. 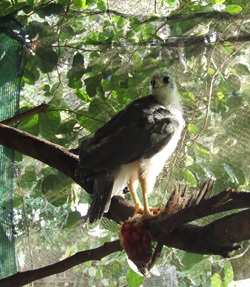 The eagle was a sub-adult female who was most likely injured during the previous night’s storm. The eagle was assessed by Casino Vet Clinic and x-rays revealed no broken bones but she was diagnosed to have significant bruising and concussion. 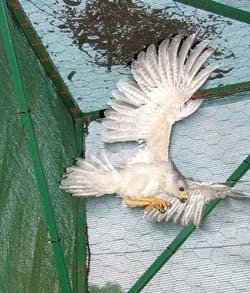 She was placed into a raptor hospital aviary for rehabilitation. 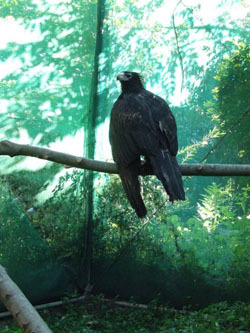 After almost four weeks of care, she was transferred to neighboring branch, WIRES Clarence Valley, to Maggie’s large flight aviary. Here she exercised and gained strength over the next week. After nearly five weeks in care she was taken home to her valley at Sphinx Rock and released. She soared and circled, calling for her mate. This magnificent bird is back in the wild where she belongs. 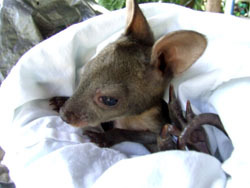 Thank you to local residents for saving the life of this tiny Red-Necked Pademelon after she was orphaned due to a car accident at Rosebank. 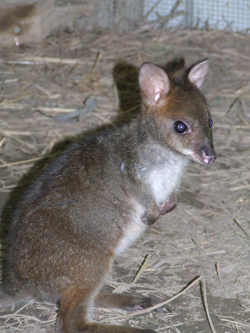 She is doing well and will be joining other Pademelon's in care in an outside enclosure before too long. 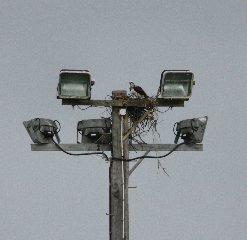 Thank you John & Deidre for email below bringing to our attention the plight of this pair of Osprey. Hello - As you may be aware Osprey breeding facilities have been established at the small boating car park South Evans Head. 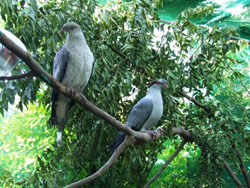 The breeding facility has been successful from observation over recent years. 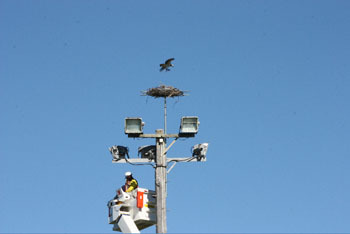 We wish to report that a pair of Osprey are endeavoring to build a nest on a light pole in the Stan Payne Oval. To-date they have been a little unlucky not being able to build their nest . The sticks are however gathering among the lights on top of the pole. National Parks were contacted and a positive result was achieved for these beautiful Osprey listed as a Vulnerable species in NSW. Before felling an old tree on their property Bekki and her family ensured nothing was calling the tree home. Unfortunately after the tree came down two juvenile gliders were found. Shortly afterward Dylan saw an adult glider and after catching it saw it had an empty pouch. 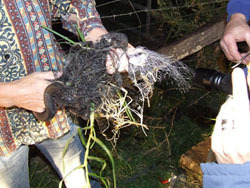 WIRES was called and the three gliders were taken into care and identified as Feathertail gliders. It was established all were uninjured and it did not take long for mum to claim her joey's. They were kept in care for a few days to ensure they were alright. 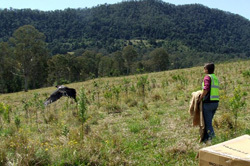 Mum was able to feed her joey's whilst a suitable box was made in order to return the gliders to their home territory. WIRES carer Leoni went back out to the property and erected the glider box high in a tree close to where the first tree had been felled, in the hope that the rest of the colony that would have been in the original tree would make use of this glider box until they could establish a new home. Seen in image above in their artificial nest whilst a suitable box was made for their return to the wild. Thank you Bekki & Dylan for calling WIRES so promptly, not only did you save these gliders, you also enabled WIRES to give the rest of the colony a place to call home. 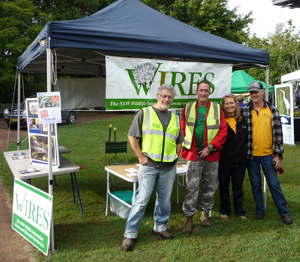 World Environment Day at Mullumbimby was a great success, WIRES members Katy Stewart, John Milford, John Purssey, Virgil Nisbet were kept busy giving out information to interested Members of the Public. 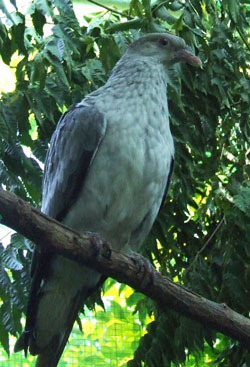 These beautiful endangered species Top Knot Pigeons have just been released back into the wild after some time in WIRES care. One with a broken wing and the other with severe debilitation and loss of tail feathers. Wires 7th anniversary celebration was held at the Eltham Hotel. 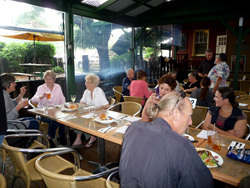 It was wonderful to see so many, 42 attended our celebration, and the Eltham Hotel was a great venue with plenty of room for our sit down lunch. 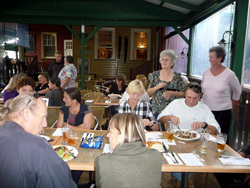 It was also a good opportunity for people who have only known each other on the phone to meet face to face, there was much laughter as people met someone they had talked to many times but never seen. I was asked by a number of people if we could have more days like this. Many thanks to Lib for organising this special day. Thanks also to Rick for his very interesting talk on our branch’s history and it’s achievements over the past 7 years. Thank you Clint for calling WIRES with this very young Blue-faced honey eater chick found alone on the ground.. Seven days in care so far and feeling far brighter than I was this time last week. I weigh 65grams now, really enjoy my food and yesterday I climbed out of my nest and stood on a log! Aren't I clever? 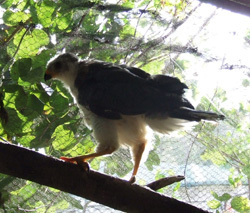 This week I moved into the aviary and discovered what my wings are for. Flying! I have been doing some serious practice and improving every day. I've also been learning how to recognise my own food as I'm planning on being independent as soon as possible. There's a lot to learn but my carer has been showing me some very interesting flowers and insects which I seem to have an overwhelming desire to sample...Its been a good week. I’ve moved out with the big birds! I spent this week getting used to the great outdoors and returning to my aviary to rest. I met a very friendly little group of blue-faced honey eaters just like me who bring me the most delicious edible gifts and keep me safe so I’ve decided to spend more time with them. Well, I had a pretty rough start, but life just seems to get better. That's a juvenile honey eater feeding me in the picture, his face hasn't’t turned blue yet either, but he has been trusted with the job of looking out for me! I think I look much bigger and stronger though, don’t you? This little fellow stayed around our property for a week for so while being feed by the juvenile. This ‘guardian’ bird separated himself from his little band of family and remained with the young one until he could be encouraged to move on. We see them regularly as they move through the area at first light and again just before dark. We can easily recognise the young bird as he always stops high in the same tree in our yard before moving on. Thanks again Shane for contacting WIRES and giving this little character the best chance he had. All was quiet since Dave and I attended the WIRES Rescue & Immediate care course in late February 2011, until a few weeks later when we received our first call from the hotline. 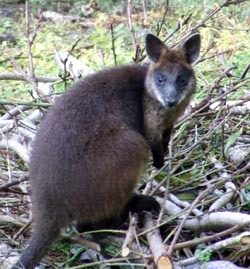 The animal in trouble was a Swamp Wallaby which had been hit by a car in Baywood Chase. Off we went, confident that we had the equipment we needed; blanket, scissors, pillowcases etc. Of course there was also a little trepidation. The wallaby had managed to hop into a gully in a wooded area near the golf course. Unfortunately this was just off a fairly busy dog-walking track. We spent the first hour observing the wallaby and asking dog walkers to keep their dogs on leads. It was definitely a good idea to wear the WIRES vests because when dealing with the public it makes it a lot easier to approach them, especially when asking for dogs to be put on leads. I am sure some people assumed we were rangers and automatically put their dogs on leads when they saw one of us approach. At first we thought the wallaby might not be badly injured as it did hop a little. However once we managed to get closer we noticed a big gash on the side of the head and a severely damaged jaw. After speaking with Leonie and Sue (Macropod co-coordinators) we soon realised that we might have to organize to have the wallaby euthanased. 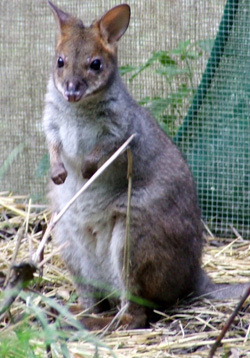 From where we were, we could not see a pouch so we made the incorrect assumption that we had a male wallaby. It wasn't’t until Sue said that if we could not see testicles it was probably female; a very important piece of information. Guided by our co-coordinator we called the police who reached us within 15 minutes of the call. Two officers arrived. 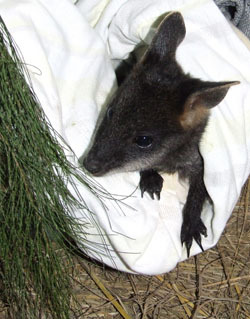 By this time Dave had made his way down the gully and had a blanket over the wallaby’s head. It was clear that this was not an easy task for the officer who I think was moved by the need to use his firearm. 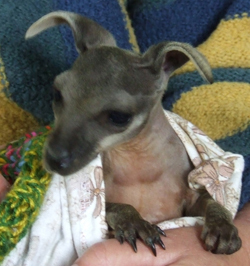 Once the wallaby had been euthanased by the police, Dave put his hand into her pouch and pulled out the most beautiful joey who had survived the ordeal with no injuries. 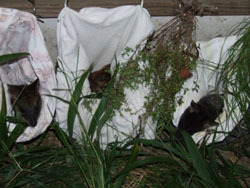 Then, after replicating the mother’s pouch as much as we could using warm water bottle and pillow cases, we transported it to experienced WIRES macropod carer, Bess. Bess weighed it (330 grams) and then put it into her special humidicrib. So in the end I guess the outcome was good. We managed to ensure that the wallaby was relieved of her pain and distress as quickly as possibly and her young joey was delivered uninjured to an experienced macropod carer. Our little swamp wallaby is now in a nursery pen with others of her own kind, seen in image on the right in the safety of her pouch peering out at what is happening in the pen. At the moment she is the youngest, the other two in image on the left are also both from car accidents where their mothers were killed. All will be released together as a family group when ready to face life in the wild. 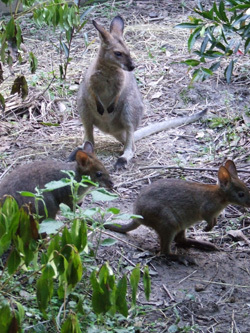 The little Swamp wallaby has now been released with her family group, all are doing well and slowly dispersing. 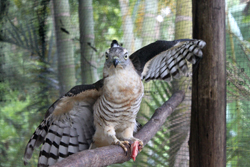 A juvenile Pacific Baza was found on 21st January sitting on the side of the road at Mullumbimby. Rose was driving past and saw the little fellow and she called WIRES. Another Pacific Baza was found at Goolmangar by Chris on 25th January, slightly younger than the other one, the two birds have been raised together. Both are now well and truly snatching bugs out of the sky with their talons and will be soft released together fairly soon. 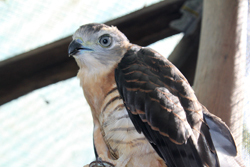 Thank you to Rose and Chris for calling WIRES and giving these beautiful raptors a second chance at life. Dianne's son was out looking at the flood waters when he came across a dead wallaby hit by a car, being responsible he checked the pouch and this little threatened species Red-Legged Pademelon joey was saved. Dianne called WIRES for help as the family was cut off by floods and would be so for at least 5 days. Luckily she had some formula on hand that would be suitable for a little joey and over the next 5 days the family did a wonderful job feeding and caring for this little joey. 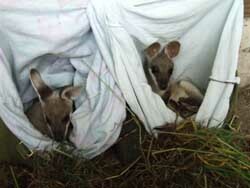 As the water receded the joey was brought in to care with WIRES and she is now in the company of another 5 joey's. She will be released back to the wild in about 5 months time. Thank you Dianne for calling WIRES. 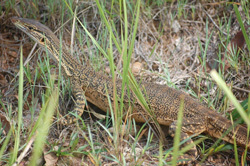 A Goulds Goanna came in to care on 5th December. It was found near a shed on semi-rural property at North Casino, lying on its back and unable to right itself. 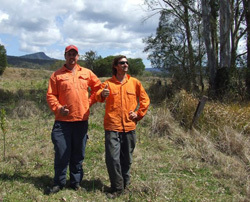 The property owners (Ben and Trudy) pulled a few small reptile ticks off it, but the goanna was in a bad way. Trudy called WIRES and delivered it to my house - while they were there I had a quick look and it was not very well at all, it was very quiet and unhappy. The goanna was transferred to reptile specialists Michael and then Tony where it recovered over the next few weeks. It was released back on to Trudy and Ben's property on 2 January 2011 fully recovered. 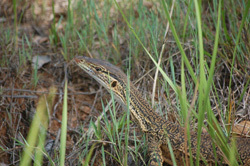 Images taken by Helen Carlos as the Goanna was released.